Patrick Pok-man Leung is a dedicated pianist, violinist and chamber musician who settles in Austria. He obtained his Master of Arts in violin performance with honours at the Universität Mozarteum Salzburg, and subsequently earned a teaching position as a répétiteur at the university. Born in Hong Kong, Patrick started playing piano at age five and violin at age seven. Between 2006 and 2009 he studied at the Universität Mozarteum Salzburg in the violin class of Paul Roczek. Piano chamber music lessons with Imre Rohmann played an important role in his artistic development. Strong influence from Rainer Schmidt helped him to expand his field of musical vision. Patrick joined the faculty of the Universität Mozarteum Salzburg in 2010, and is currently the staff piano accompanist of the classes of Paul Roczek, Klara Flieder, Igor Ozim, Rainer Schmidt, Lukas Hagen, Christos Kanettis and Brigitte Schmid. He also serves as piano coach in the International Summer Academy Mozarteum Salzburg. Patrick enjoys considerable success as a performer throughout continental Europe. He has performed with renowned artists such as Rainer Schmidt, Klara Flieder, Christophe Pantillon, Peter Langgartner. A highly sought-after chamber music partner, he appears in music festivals such as Salzburger Festspiele (Austria), Festivalul International Timisoara Muzicala (Romania) and Young Classic Europe (Germany, Slovenia), and his recordings have been broadcasted by RTHK Radio 4 in Hong Kong, ORF in Austria and Radio Slovenia International. In 2014 he performed the complete cycle of Mozart Violin Sonatas with Klara Flieder in Shanghai, China. Pianist and chamber musician Huang Mengmeng is currently Director of the Piano Association under the Chinese Musicians’ Association, Chair of the Collaborative Piano Division, Orchestral Instruments Department, Associate Professor and Master’s Supervisor of the Central Conservatory of Music (CCOM). He was a visiting scholar at the Conservatoire National Supérieur de Musique et de Danse de Paris (CNSMDP), the Artistic Director of the Collaborative Piano Festival of CCOM which is the first one in the collaborative field in China, and Chair of the Collaborative Piano of the XV Yehudi Menuhin International Competition for Young Violinists. Mr. Huang was born to a musician family and started playing the piano at a very young age. His former teachers included Xie Geng, Lyu Xiaobai, and Xie Huazhen. Mr. Huang has been on the faculty at CCOM since 1996. Mr. Huang has been awarded many prizes in both domestic and international competitions, among which are the best collaborative pianists at the IV and the V International Tchaikovsky Competition for Young Musicians, the Antiquea Marca Firmana International Violin Competition in Italy, four successive editions of Hongkong International Violin Competition, the Second Chinese Golden Bell Awards for Music, and four editions of China’s National Violin Competition. Mr. Huang’s pupils are also winners of numerous competitions. 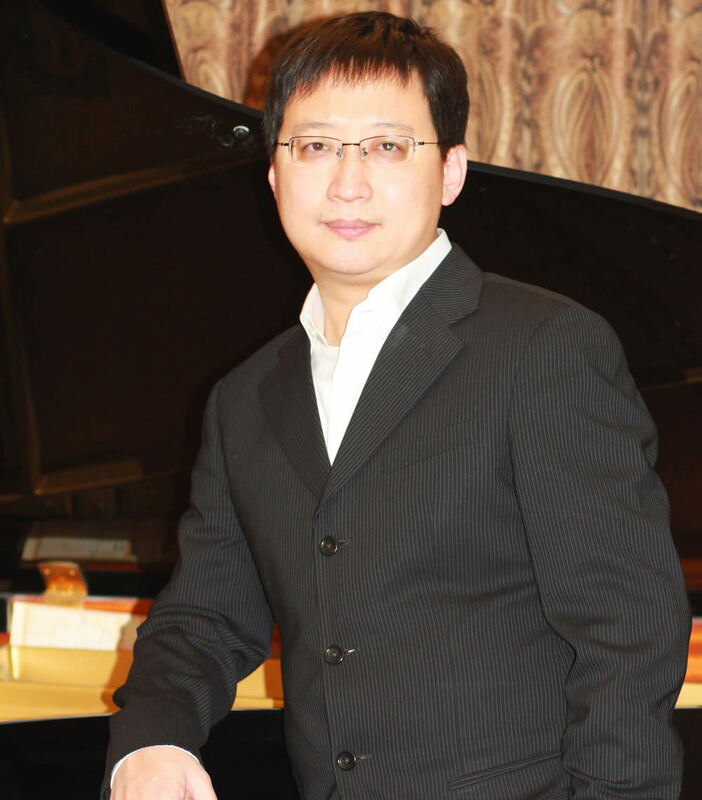 Mr. Huang Mengmeng is an active and highly acclaimed pianist. He has collaborated with a number of world-renowned musicians, including Cho-Liang Lin, Sheng Zhongguo, Xue Wei, Ning Feng, Li-wei Qin, Lu Siqing, Yang Tianwa, and Li Chuanyun. He has performed in United States, Canada, Germany, Britain, France, Italy, South Korea, Japan, and hundreds of cities in China. Mr. Huang is also the founder of the Harmony Piano Trio, and he dedicates his passion to promoting chamber music. Mr. Huang has established a close relationship with China’s highly recognized violinists, singers and folk musicians. Albums that Mr. Huang recorded include A Musical Genius, Virtuoso & Fire, and his many live performances. As a frequently invited expert, he gave performances and lectures in China’s famous theaters and almost every conservatory and music school in China. From an early age, the pianist Tatiana Chernichka was among the most promising talents of her generation. Born in Novosibirsk, Russia, she was awarded the First Prize in the International Chopin Competition in Göttingen, Germany when she was only 10 years old. Two years later, she gave her first solo recital and made her debut with the Novosibirsk Symphony Orchestra, performing the Piano Concerto No. 1 in Eb major by Franz Liszt. Tatiana Chernichka has since been successful in numerous competitions. She was awarded the Third Prize in the 58th Feruccio Busoni International Piano Competition in Bolzano, Italy, as well as in the 60th Maria Canals International Music Competition in Barcelona. She was also a finalist in the renowned Concours Reine Elisabeth in Brussels. As a prize winner in the Busoni Competition, she was given the opportunity to participate in three master classes with the legendary Alfred Brendel, in Essen, Bolzano and Reykjavik. The young pianist has since performed in Germany and abroad, throughout Europe and Russia. She has been a guest artist at such festivals as the “Armonie sotto la Rocca” in Italy, “Musikal Kremlin” in Moscow and the “Ruhr Piano Festival” in Essen. She also took part in the Tel-Hai Piano Master Classes in Israel. Tatiana Chernichka has played with such orchestras as the Mozarteum Orchester Salzburg, the Israel Symphony Orchestra, the “Musica Viva” Orchestra, the Orchestra of the Gustav Mahler Academy and the Polish Chamber Orchestra “AUSKO”. Tatiana Chernichka received her early training at the music school of the M. I. Glinka Conservatory for gifted youth in Novosibirsk, where she was instructed by Professor Mary Lebenson. She has lived in Munich since 2003, where she studied with Professor Eliso Virsaladze. She received her Master’s Degree with honors at the “Mozarteum” Salzburg in 2011, where she was instructed by Professor Klaus Kaufmann. Tatiana Chernichka has received a grant from the Foundation “Live Music Now” in Munich. Since 2009 she has also held a contract for accompaniment at the Munich University of Music and Performing Arts.